Philippine prices and local availability, up ahead! Despite its recent lows, Samsung remains to be a big time player in the smartphone wars, and the company's newest spawns will surely make you wish money isn't a problem. The Korean titan has just unveiled two of its newest top-of-the-line offerings, the Samsung Galaxy Note 5 and the Samsung Galaxy S6 Edge+, in a huge event held in New York City. The two mobile wonders were met with tons of applause and resounding oohs and aahs, and it's easy to know why. So, what's up with Sammy's newest high-end offerings? Read on to see what the hype is all about. The latest arrival in Samsung's hugely popular phablet line, the Galaxy Note 5 is a legit mobile powerhouse blessed with all the power worthy of the big bucks. How does eight cores of pure computing power sound? How about four GBs of memory for your multi-tasking chores? Yep, this one definitely wants to get (virtually) punished! Why it's a must-have: Samsung's Note line has been pretty consistent in coming up with solid products, and the Galaxy Note 5 should be part of the tradition. Aside from having cutting edge specs, it also has the size so you can do more stuff easily, like working on documents to displaying multimedia content on the go. 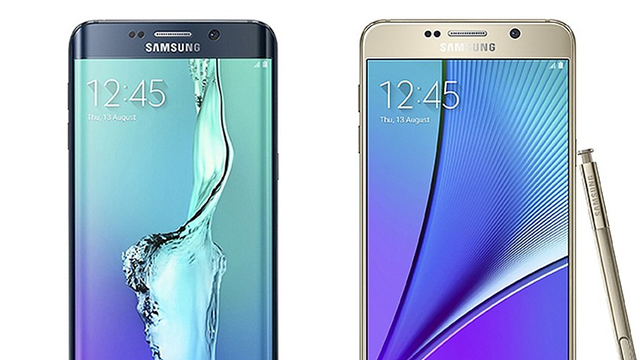 Meanwhile, the Galaxy S6 Edge+ is the Note 5's literally curvier sibling. The follow-up to the Galaxy S6 Edge, it comes with a curved display that shows visuals even on the sides, offering added ways on how to use the device (e.g. displaying notifications on the sides for easier viewing at an angle). Compared to its predecessor (which is already a souped-up device in its own right), the Galaxy S6 Edge+ packs a larger frame and a bit more power. Like the Galaxy Note 5, it now has a 5.7-inch display (compared to the Galaxy S6 Edge's 5.1 inches) and 4GB of RAM (compared to the first-gen's 3GB). Notable extras: Curved display for side-view applications, NFC for wireless transactions, TouchWiz UI for a unique Android interface.